Comments: A witty, fast-paced, and entertaining show based on the popular video games. Wild ARMS isn't at all what I expected to find. I've seen anime series based on video games before. 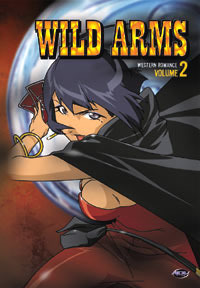 I've watched anime that mixes science fiction with the Old West, as well. I ordered the first volume (and artbox) of this series on a whim simply because it was on sale, but I can honestly say I'm glad I did. While this show may not be a life-altering experience, it is a load of fun to view, and I'm eager to see where it's going next. The main plot for the series concerns Sheyenne Rainstorm as he scours the wilderness in search of his real body. An expert marksman and reincarnation of the "Evil Race," he was once a force to be reckoned with. Men feared his wild behavior and fighting prowess and women loved him. Despite his current diminutive state, he's still quite a formidable foe - even if he no longer gets the same kind of attention from the ladies. Sheyenne travels with Dr. Kiel Arronax, a man whose kindness belies his rough looks. Even though he knows the truth of Sheyenne's situation, he almost treats the firey gun-wielder as a son. He certainly doesn't allow Sheyenne to drink alcohol anymore. Kiel's true intentions remain a mystery, but he appears to be driven by morality rather than greed, so he is a good ally for Sheyenne. Kiel and Sheyenne travel together with a small creature, known as a popepi-pipepo, named Isaac. These creatures are extremely rare and live for thousands of years, and they possess a good deal of wisdom gathered over their long lives. In pretty much every episode, however, there are three other characters that regularly cross paths with the three men. Loretta Oratorio (voiced in English by Wendee Lee) and Mirabelle Graceland also travel with a popepi-pipepo named Jerusha, who happens to be Isaac's ex-wife. Loretta is a Crest Sorceress (a magic-user able to summon spells with card-like Crests) and Mirabelle is a Crimson Noble, a being (somewhat similar to vampires) that feeds on blood and can change into a flying creature at will. The three women aren't quite as noble-minded as Kiel, however, as they travel the countryside searching for treasure to steal. Yet, even though they may appear greedy on the surface (and, let's face it, they are greedy), they usually end up aiding Sheyenne and Kiel in some way or another. This volume features a train hijacking, a trip to an all-female religious temple, an amusing (but deadly) con in the middle of the desert, and a trip to a gambling town. Each episode is more or less self-contained, but as I mentioned above, very amusing. There is almost always some sort of twist or surprise that is revealed by any given episode's end, and it keeps the story from falling into too simple a pattern. Even though things are lighthearted and filled with plenty of humor now, there's a good dose of action and the hint of a story that's larger in scope than the just the recovery of Sheyenne's body, and that's why I like this show. It's fun, but it gives the impression that it's actually going somewhere, as well. This series only recently came out (even the games aren't THAT old), and as such it looks rather pretty. Colors are vibrant and the animation is smoother than I expected it would be. The character designs are appealing and unique - again, especially for a show based on a video game. Computer graphics are occasionally used, but they are very low-key and do not distract much from the action of the show. The first episode on this volume (episode six) marks the first time I've noticed two themes from the video game series. For me, that's a big drawing point, since I really enjoyed the music of Wild Arms. The music from the first game was composed by Michiko Naruke, and the tracks featured in the TV series (so far) were "Into the Wilderness" and the "Town" theme, easily two of my favorite game music tracks. It's nice to hear them resurface on my television. Kow Otani does the music for the series, with Sho Wada providing only the main theme. The end theme is a completely unexpected punk rock song with heavily distorted lyrics, and I love it to death. The voice acting is nice on both ends, but (as always) I lean towards the original track rather than the dub. Much of the show was ad-libbed in Japanese, so it's nice to see the sometimes-crazy things the cast comes up with as the story progresses. It seems that, as a rule, English voice actors like a solid script more than coming up with material on the spot, though I can't honestly speak for this particular dub cast. Still, one possible advantage the Japanese voice actors have over their English-speaking counterparts when ad-libbing is the fact that Mitsuo Iwata and Rikako Aikawa (the seiyuu that portray Isacc and Jerusha) are actually married in real life. As the excellent bonus interview with the Japanese cast suggests, a married couple might do better than others when it comes to making up funny lines on the spot. There are some nice extras here, including a model gallery, the original Japanese trailer for the show, and a very long interview with the Japanese cast. Personally, I loved the cast interview, for it really offered insight concerning the creation of the show. I'd like to see more series include such bonus material, if possible. For a simple TV show, I was pleasantly surprised to find such interesting extras on this volume of the series. This is an upbeat show that's great if you need something to balance a darker series such as Devil Lady or Betterman, for it should keep your interest with the good mix of humor and action. There's potential here for more than just an amusing momentary diversion, and with luck, it will be fulfilled with the next few releases of the show on DVD.